Newsflash: within the firearms world, people often use different safety rulesets. 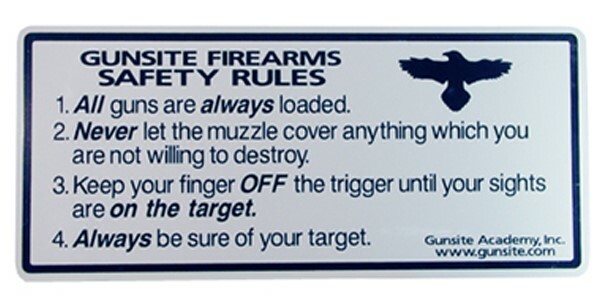 The most common and most widely-trusted rules come from Gunsite in the form of the Four Rules. Gunsite Four Rules: 1) All guns are always loaded. 2) Never let the muzzle cover anything which you are not willing to destroy. 3) Keep your finger off the trigger until your sights are on target. 4) Always be sure of your target. Many people have taken the Four Rules and adapted them in different ways. We quibble, endlessly, over the wording. Should it say “cover”, or “point at”? Should we keep the finger “off the trigger” or “off the trigger and high on the frame” or simply “indexed high on the frame”? And those are just about the wording variants within the most commonly accepted ruleset. That’s controversy enough! But of course there are other rulesets. The NRA Rules come to mind: Always keep the gun pointed in a safe direction, Always keep your finger off the trigger until ready to shoot, Always keep the gun unloaded until ready to use. That’s probably the most well-known ruleset among people who have not grown up on the self defense side of the shooting world. This ruleset is widely preferred by people who use guns as ballistic golf clubs — weekend toys rather than working tools. No matter which ruleset is ostensibly in use, some people have a very limited understanding of what the safety rules really mean. For example, far too many people act as if the Other Three Rules (or any of the NRA ‘always’ rules) actually only apply to guns known to be loaded. This is incorrect, but common. How many times have you heard someone say, with feeling, “… but it’s unloaded!” as a defense when someone ducks away from their wandering muzzle or suggests they should keep their finger off the trigger? Others may talk a good game about the gunhandling rules and protocols, but then be willing to throw one or more of the bedrock rules right out the window when an important-enough goal comes along. This seems to happen particularly often to people who have not had a deep grounding in how to really think about the different rule sets and gunhandling paradigms in different situations. Even though memorizing the rules can be important, it is often not enough to simply memorize a checklist. That’s simply where it starts. Can you recite — from memory — the Four Rules, or the NRA Rules, or the preferred ruleset from your nearest professional firearms training school? Good! That’s a start. But it is most emphatically not the end of the story. Those rules, in whatever form you prefer and use, are not complete. Each rule is like the chapter heading in a book. They tell a person what’s inside the chapter, and when well-worded they may sum up the most important ideas, but they do not give a person all the information they will need about the subject. They simply give us a place to start and a way to organize what we need to know about handling deadly weapons. People who teach this stuff need to have a much wider understanding than most do. They must move beyond a rote recital of their preferred ruleset. They have to understand the bedrock principles that tie together the different rulesets. And — like everyone who handles guns! — they have to be able to apply those principles in many different situations. Here’s a clue: when you meet an instructor who ‘hates’ one of the rulesets so much that they cannot even explain that ruleset and what it means, that is someone who does not yet grok the bedrock principles that the most common rulesets all share. (And that’s an instructor to avoid, natch.) Once a person does grok those principles, they can use any of the common rulesets to explain them. And even though they may have a preferred ruleset, they won’t have a problem explaining the same principles using different words. And they will follow the same core principles of safe gunhandling no matter what is going on around them and no matter which set of words they prefer. Does this matter to you, as an ordinary gun owner or person interested in self defense? Of course it does! If you are a consumer of gun-related information (as you are, since you are reading this blog), you are at risk for absorbing bad ideas and poor modeling from sources you should be able to trust. Some instructors will take rather extreme risks for benefits that could be achieved without that risk. This might happen because they don’t have enough imagination to figure out how to follow the bedrock safety principles and reach their stated instructional goal, or because they don’t really understand the basic rules and their function, or for some other reason. For you as the student, this matters. As a savvy consumer of firearms-related information, you must understand the issues at hand well enough to choose between good and bad sources of that information. In any case: not every person who calls themselves an instructor will follow the most basic principles of good gunhandling with their students. This is something we don’t explain enough to beginning students, even though we really should. Not every instructor can be trusted to model responsible gunhandling in their classes, no matter which set of rules they preach. This makes it very, very important that students shop carefully for their instructors. Definitely a case of buyer beware. For example, I personally would never say to a group of students, “We’ve unloaded all these guns, so none of the other rules matter anymore…” That’s not an acceptable risk because it would be tragic if someone made a mistake about their gun’s status in that situation. It’s a violation of a bedrock principle for safe gunhandling. And yet, I have been in a class where that was essentially what happened as the instructor passed out ‘unloaded’ loaner guns to students while we were all facing each other around a round table at the back of the range. In that instructor’s mind, that was a quick and relatively simple way to pass out the loaner guns, and he ‘knew’ the loaner guns were unloaded, so… good gunhandling habits went out the window in the interests of convenience. Fortunately, there are other convenient ways to loan guns to students, and nearly all of those ways also stay within the bedrock principles of gun safety. This is also true with nearly every other goal a person might name as a would-be ‘justification’ for ignoring the safety rules: dry fire, role play, gun cleaning, whatever. The goals, whatever they are, can be reached within the rules — as long as someone thinks about both the goals and the safety issues at the same time, and does not treat them as separate issues that have no bearing on each other. Another example: When we need to handle real guns for dryfire, inside or outside a classroom, we can use a real backstop instead of an imaginary one. The rule is, always use a real backstop with real guns. Save the imaginary backstops — “designated” safe directions rather than genuine ones — for use with imaginary guns (such as blue plastic dummy guns and AirSoft guns). The instructional and practical goals for dry fire can be reached within the Four Rules, within the NRA Rules, and within the principles shared by all common gunhandling rulesets. As I’ve said many times before, checking the gun’s chamber does not erase the consequences of getting it wrong when you handle the gun. Unless you’re fully prepared to accept the consequences of making a mistake about the gun’s loaded or unloaded status (a dead student? a bullet going through a neighbor’s house? ), never rely on simply checking the gun, or even double or triple checking it. That’s why the “target/backstop” aka “safe direction” rule exists. No matter which ruleset you prefer to use, be aware that other people often get … religiously … wrapped around the axle with their preferred wording. Keep a flexibly open mind about your own wording when necessary, but utterly refuse to compromise on the bedrock principles.